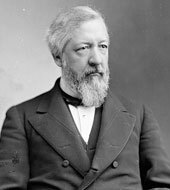 James G. Blaine served two terms as Secretary of State. He was first appointed by U.S. President James A. Garfield, serving from March 7, 1881, until December 18, 1881, and was again appointed by U.S. President Benjamin Harrison, serving from March 5, 1889, until his resignation on June 4, 1892. Blaine was born in West Brownsville, Pennsylvania, on January 31, 1830. He graduated from Washington & Jefferson College in 1847, then known as Washington College, and worked as a teacher for several years. Blaine moved to Augusta, Maine, in 1854 and became editor of the Kennebec Journal. Blaine entered politics as a Republican, was elected to Congress in 1862, and served as Speaker of the House from 1869 to 1875. In 1876, Blaine was an unsuccessful candidate for the Republican nomination for President, but did win a Senate seat from Maine. In 1880, Blaine was again an unsuccessful candidate for the Republican nomination for the Presidency. However, President-elect James A. Garfield offered Blaine the position of Secretary of State. After his first tenure as Secretary of State, Blaine was the Republican candidate for President in 1884, but lost to Grover Cleveland. In 1888, Blaine supported Benjamin Harrison as the Republican nominee for President. After Harrison’s successful election, he nominated Blaine to be Secretary of State for another term. Once in office as Secretary of State, Blaine encouraged peaceful relations within the Americas, and also advocated for American commercial expansion and increased naval power. Blaine negotiated for the release of U.S. citizens who had been arrested and confined without trial in Ireland as part of a British crackdown on Irish nationalist rent boycotts. Blaine unsuccessfully attempted to negotiate peace between Peru, Bolivia and Chile, all engaged in the War of the Pacific from 1879 to 1883. He also attempted to arbitrate a border dispute between Mexico and Guatemala. Blaine’s overtures were cut short on September 19, 1881, by the death of President Garfield, who had been shot two months before on July 2. Blaine remained in office through December 18 while Chester A. Arthur, the new president, selected a replacement for him. Under President Harrison, Blaine’s first challenge was to counter German expansion in Samoa, where the United States competed for influence. The agreement reached in 1889 between the United States, Germany and the United Kingdom did not resolve the tensions between those countries, but further eroded Samoan sovereignty. During this term, Blaine attempted to negotiate a disagreement over Canadian fur seal hunting rights in the Bering Sea. He also faced controversies over the lynching of Italian citizens in New Orleans in 1891 and an attack on U.S. sailors in Valparaiso, Chile. Blaine oversaw the Pan-American Conference, which had been organized by his predecessor, Thomas Francis Bayard. The conference covered trade, communication and legal issues, and eventually led to the establishment of the Pan-American Union. Blaine resigned from his post on June 4, 1892. His resignation caught everyone, including President Harrison, by surprise. Although Blaine was a candidate for the 1892 Republican nomination, his poor health meant that he was not considered seriously. Blaine’s health declined sharply after his resignation, and he died not long afterward on January 27, 1893.